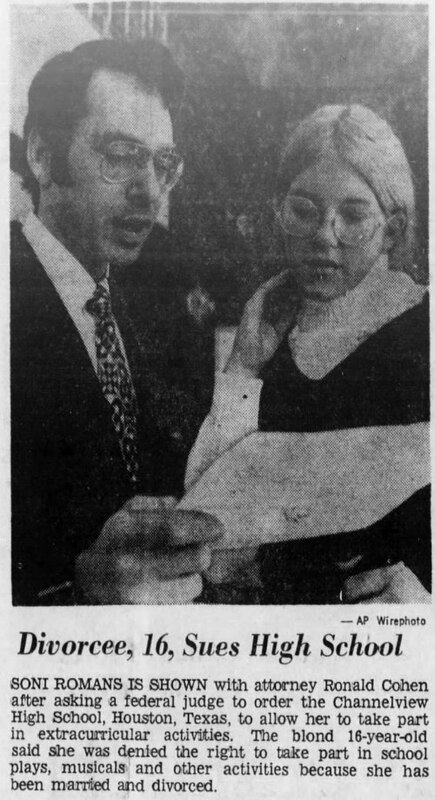 May 1974: Three students at Northeast High School in Philadelphia participated in a medical experiment in which for five days they experienced what it was like to be blind. 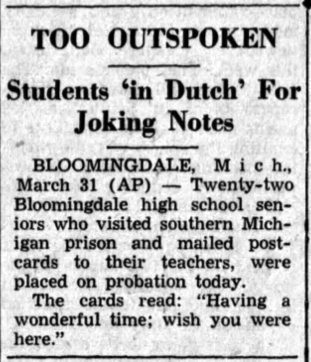 I'm guessing this kind of experiment would never be allowed nowadays in a high school. 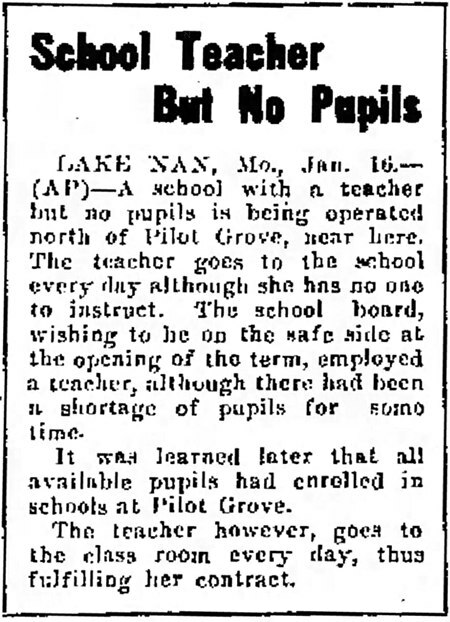 An early example of the "teacher paid to do nothing" phenomenon. Nowadays we've got the Rubber Room. 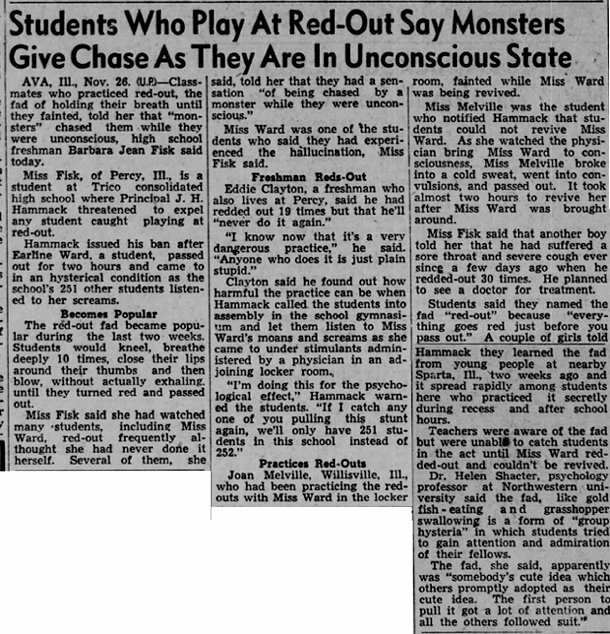 The 1948 high school fad of "Red-Out." Certainly one of the stupidest high school fads ever. What it involved: "Students would kneel, breathe deeply 10 times, close their lips around their thumbs and then blow, without actually exhaling, until they turned red and passed out." Bonus thrill: students would wake up believing they had been chased by monsters! The story below is from 1939. 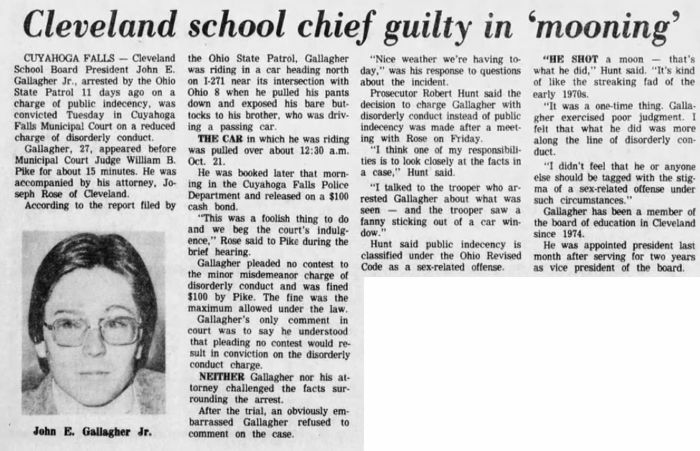 Would the students have been dealt with as harshly today? My guess, based on all the stories of overreacting school officials that Chuck reports, probably yes. I wonder how one went about setting up as a freelance massage therapist in 1949. Did the College of Swedish Massage mail order course culminate with a nice diploma you could display, something along the lines of a "Bra Inspector #23" badge? And exactly how, as a student, did you practice your techniques at home, and on whom? 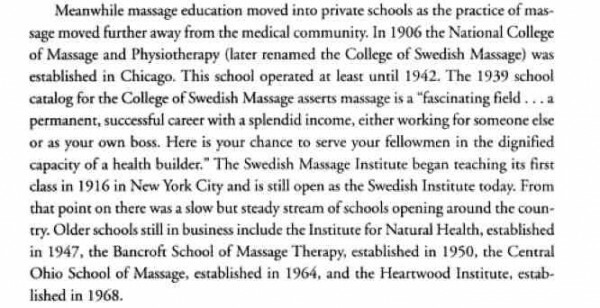 As the quote below tells us, the College of Swedish Massage eventually was superseded by the more proper Swedish Institute, still teaching massage therapy today. I wonder if you can take their courses online? 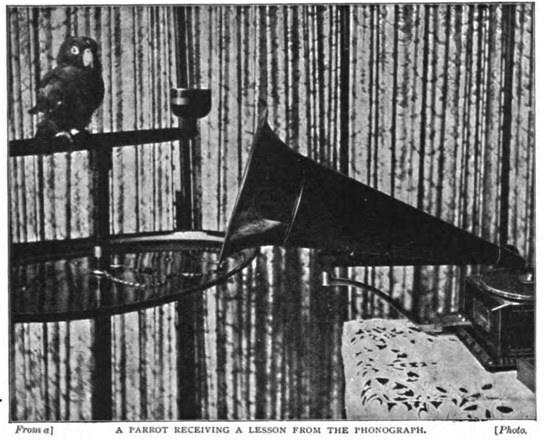 Philadelphia can boast of a phonograph school for parrots. It is said to be the only institution of its kind in the world. Here parrots are taught to speak by means of the phonograph, and during the brief time that the school has been in existence over one hundred birds have been taught to pronounce all kinds of sentences and phrases for the edification of themselves and the amusement of their owners. This is the twentieth-century method of teaching a parrot. Hitherto he has been taught by tutors, generally women, and, if the truth must be told, he has not been altogether a satisfactory or exemplary pupil. First of all his teacher has to repeat the phrase or sentence over and over again, hundreds and thousands of times, before "Pretty Polly" is able to pronounce it. This in itself is a tiresome procedure, but it is rendered more fatiguing on account of the fact that the speaker must be hidden from the parrot. She has, therefore, to crouch behind a screen or to cover the cage of the bird with a large hood. The former is regarded as the best method, as no self-respecting parrot likes to be left alone in the dark, but to hide oneself secretly behind a screen and then repeat the words, "Pretty Polly," "Pretty Polly," a thousand times is surely not an enviable task. The fee for a full term of six months is eight pounds. Parrots are often sent, however, for a briefer period, when the rate charge is ten shillings per week, including, of course, board and lodging. Sometimes, when a pupil has to be taught unusual phrases—French or German sentences, for instance—the tuition rate is a little higher. 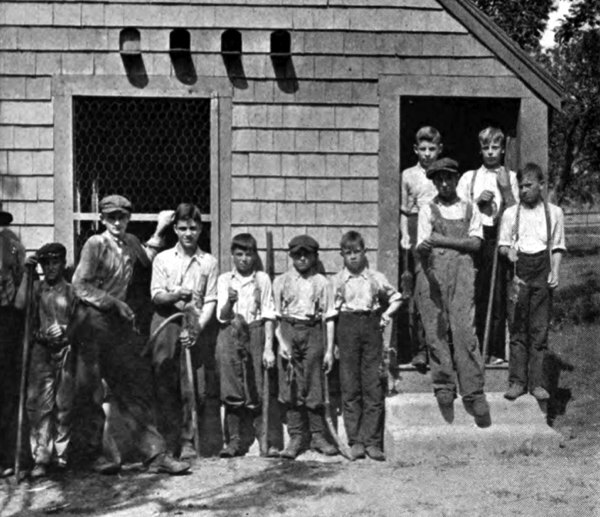 At the Farm and Trade School on Thompson's Island, where the boy pupils are taught to kill rats, as all boys should be, there is a henhouse built with a cement foundation, but it has an earth floor and no foundation wall on the south side; therefore it is not rat-proof. The wooden floor of the main house is raised about three feet above the earth, leaving a space below it for a shelter for geese. Here the rats have burrowed in the earth, and as it was considered unsafe to use carbon bisulphide there on account of the fire danger, water was suggested. Two lines of common garden hose were attached to a near-by hydrant, the ends inserted into rat holes and the water turned on. All rat holes leading from the henpens to the outer world were closed with earth, and several boys were provided with sticks, to the end of each of which a piece of hose two feet long had been attached. A fox terrier was introduced into the henpens, and in about half an hour the rat war began. As the half-drowned rats came out of their holes somewhat dazed they were struck by side swings of the hose sticks, which knocked them off their feet, to be killed by other blows. If one escaped into the henpens, boy or dog killed it. This operation was repeated later from time to time. Four successive battles several weeks apart yielded 152 rats from under and about this henhouse, and no doubt many young rats were drowned in their nests. Where no high-pressure water main is available burrows on the banks of pond, river or ocean might be cleared in this way by means of a powerful sewer pump and hose. 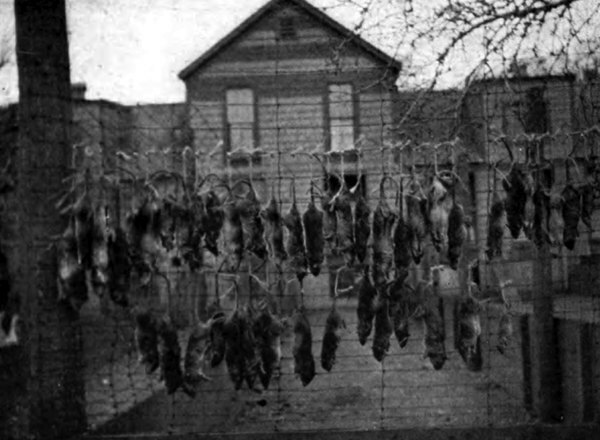 The pictures show the schoolboys showing off their kill, as well as the rats strung up.